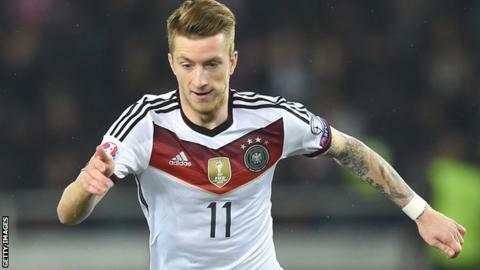 Marco Reus is out of Joachim Low's Germany squad for the Euro 2016 Group D qualifiers against Poland and Scotland. The German Football Federation says Reus broke the big toe in his left foot while playing for Borussia Dortmund against Hertha Berlin on Sunday. The midfielder, 26, joined his national team-mates in Frankfurt on Wednesday, when the injury was diagnosed. Reus missed Germany's 2014 World Cup success with an ankle injury sustained in a pre-tournament friendly. He then suffered two more ankle injuries after making his comeback and made only 20 Bundesliga appearances for Dortmund last season. Germany play Group D leaders Poland in Frankfurt on Friday, a few hours after Scotland kick off against Georgia in Tbilisi. The world champions, one point behind the Poles, then head to Scotland for Monday's qualifier at Hampden.